1. Preheat the oven to 220°C, gas mark 7. 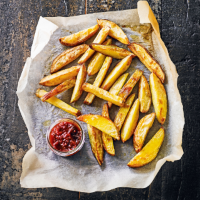 Cut each potato lengthways into 3 and each slice into 3-4 again, to give 9 or more chunky chips. Parboil for 5-6 minutes in boiling water, then drain well. Tip out onto a clean, dry tea towel and pat dry. 2. Place into a large bowl and toss with the oil and season well. Spread out onto a large baking tray with any excess oil then bake for 20 minutes. Turn each chip over and bake for a further 15-20 minutes or until golden. 3. Meanwhile, place the tomatoes, chutney, ketchup and honey in a medium saucepan and simmer for 7-8 minutes, stirring occasionally. Serve with the chunky chips.